Today, we’re welcoming Sarah from Homeschooling and Homesteading to Minds in Bloom! Sarah is sharing her unique perspective as an outdoor educator to share the learning benefits of gardening with children. Gardening with a child can be a mutually beneficial experience for both you and your young companion. Growing food offers an abundance of creative learning opportunities. I have gardened with children and written related curriculum for 15 years. Following are some of my favorite activities and reasons to get your hands dirty with your favorite youngster. Gardening is the perfect activity to help you teach a child about a strong work ethic, as there is the reward of beautiful flowers and delicious food if you put in the effort. Students will build strength and coordination as they learn to use gardening tools. Their fine motor muscles will become stronger when they weed by hand and use their fingers. Balance can even improve as your child carefully picks her way down a narrow garden walkway. Additionally, bending over when weeding can help one to stretch. All of these body-wise activities help a person to feel good, and when one feels healthy and well, self-esteem increases. I always feel reinvigorated after working in the garden with children, as each insect and worm, each juicy pea is a new discovery full of joy. I remember I had a child who tasted a beet green for the first time and delightedly exclaimed that it tasted like the ocean and that he wanted more! This boy learned that healthy food can be delicious. A garden is an ideal classroom to teach about nutrition, as there is a bounty of healthy and enticing food to taste and prepare together in the kitchen. Weeding takes away competition and helps vegetable plants thrive. Nurturing a living organism, such as a plant, is an important lesson to learn. Let your child choose a plant and name it. You may be surprised at how diligently they care for it. You can help them to notice the flower, the fruit, and the seeds, which can naturally lead to a conversation about life cycles. Dissecting a seed can help one to learn how a plant begins. Soak a larger seed, like a lima bean or a kidney bean, overnight. In the morning remove the outer covering of the seed, the seed coat. Next, separate the halves so your child can try to locate the tiny leaf (it will be white); this is the baby plant or epicotyl. Attached to the epicotyl is a small stalk. This is the radicle, or baby root. The cotyledon, or food for the baby plant, is all of the white area in the rest of the seed. There are endless opportunities to engage all five senses while you observe nature and its various organisms. By asking questions when your child notices something, you encourage deeper thinking and an increased vocabulary, as their young mind has to work to reason why or to describe more in depth. For example, if they notice a bee on a flower, go watch the insect with them and ask questions like, “What do you think the bee is doing on the flower?” and “How many different colors can you see on the bee?” What a wonderful opportunity to talk about the importance of pollinators! Herbs offer an interesting discovery of scent and taste. Have your child close their eyes and rub a leaf from an herb plant; does the smell remind him of a certain food? Try a different leaf and ask, “How are they different?” A similar game can be played once various fruits and vegetables are harvested. 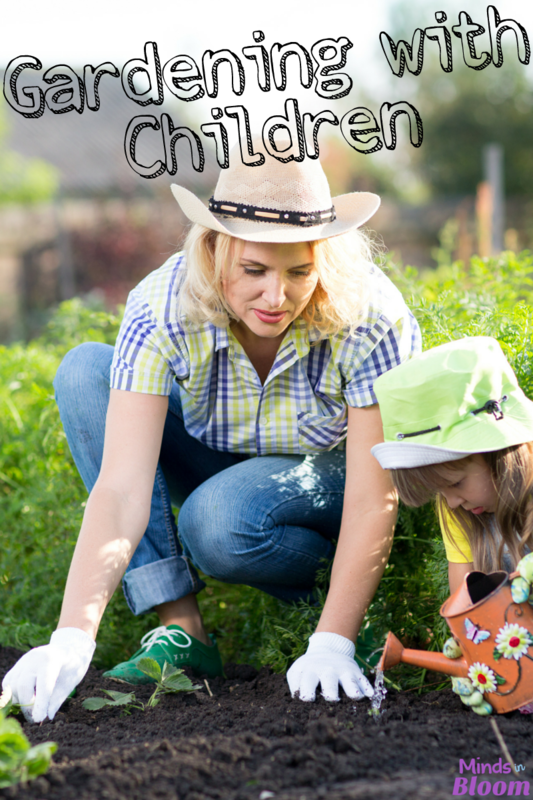 Your daughter or son can explore the creative side of gardening by pounding leaves to make artwork. You will need a rubber mallet or hammer and two white pieces of cloth. Have your child pick several leaves and flowers. Lay one piece of cloth on a solid surface. The vegetation can be arranged on it in any design. Lay the second piece of cloth over the vegetation. 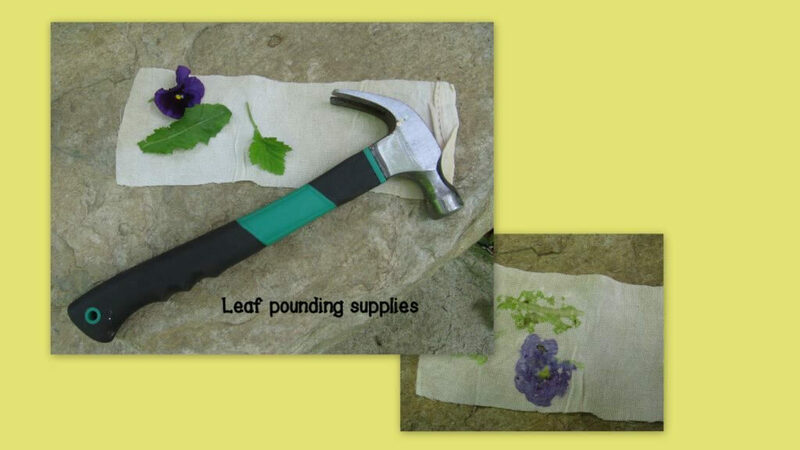 Use the hammer to pound the plant pieces until the color bleeds through onto the cloth. This beautiful art makes a lovely wall hanging. You can also harvest herbs and dry them to make potpourri or herbal teas. Nature is very busy in the summer. Ask your child to close her eyes and cup her hands around her ears to make “deer ears.” As she slowly turns her head, what does she hear? Can she hear bird songs, crickets, the breeze through the leaves? Does it sound differently if she removes her cupped hands? Why would a deer or rabbit have such large ears? The pair of you can also explore the sense of touch. Fingers can compare the feel of different soils, a hand can feel how warm a rock is once it has been in the sun, and worms can gently be handled and observed. Worms can be explored more in depth by building a worm composting (vermiculture) bin. This lesson plan is a wonderful guide to building a vermiculture container for your classroom or home. Even a young child can feel pride when they bring in a harvest that will help to feed themselves, their family, and other members of their community. When children become adults, they will want to conserve what they love. If we teach young students about the fragility, beauty, and abundance of our planet, I believe they will be activists for our collective home later in their lives. I have taught a variety of ages, mostly early elementary, for 15 years. 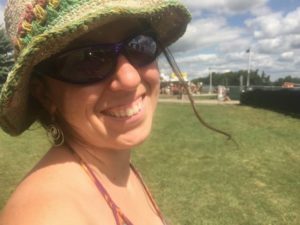 My diverse teaching career has taken me to the woods teaching environmental education, to classrooms teaching my own students, to having direct influence on the shape programming takes as a former director of education at an educational farm. It was on the farm that I started a homeschooling program. I love homeschooling and homeschoolers so much that I work for a homeschooling company now. My lessons often integrate several subjects and include hands-on, active, project-based experiences. 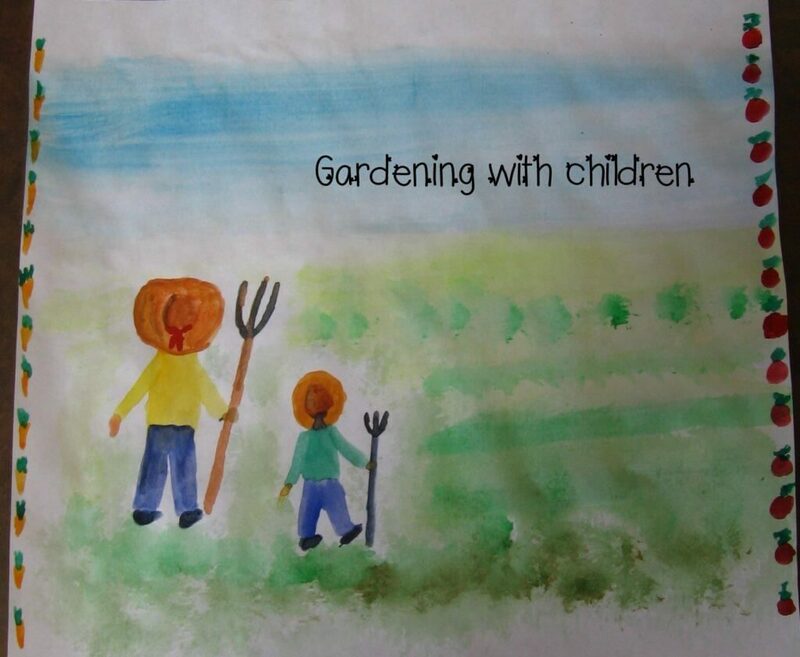 Many activities to help you further explore your garden and the outdoors with your child can be found in my Teachers Pay Teachers store, Homeschooling and Homesteading.